Drawing: A Sketch and Textbook combines essential content from a basic drawing textbook with the ample blank space of a sketchbook so that students can immediately practice what they learn. Divided into three parts-the basics, elements of drawings, and the creative process--this innovative textbook/sketchbook aims to teach students how to draw by actively engaging them in practical projects. 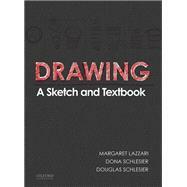 Authors Margaret Lazzari, Dona Schlesier, and Douglas Schlesier provide reproductions of student and professional artworks that can serve as inspiration/models and give students the opportunity to create a journal of drawings, ideas, notes, and inspirations, for use now and later. View how-to videos demonstrating key techniques at the book's companion website. Margaret Lazzari is Professor of Art at the University of Southern California's Roski School of Art and Design. Dona Schlesier is Professor Emerita of Art at Divine Word College in Epworth, Iowa. Douglas Schlesier is Professor Emeritus of Art and former Director of the Quigley Gallery in Clarke University in Dubuque, Iowa.